Stagecoaches were the prime means of transportation in the old west. These coaches were 4-wheeled vehicles. They were designed to be used for many purposes. The coaches of the frontier and the Wild West of American history are quite an interest and a tradition. Yet the origins were actually in the "Old World" - in England. 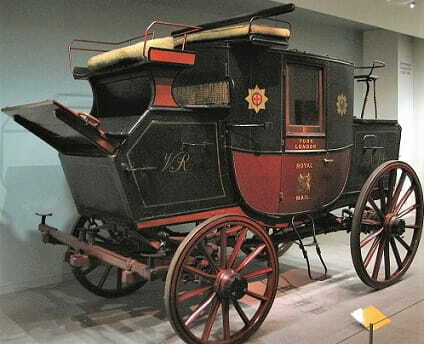 Stagecoaches were first mentioned as early as the 1200s. And the first regular Stagecoach Route in Great Britain is documented in the early 1600s.1 As soon as multiple settlements were established in the "New World" - transportation of people and goods between them were needed. Stagecoaches were the vehicle recognized for their practical utility. Routes between villages were created. Roads were built. First they were very basic and rugged. But more stagecoach traffic traveled them, and they extended farther and farther. The need for improvement was essential. Crews were hired for road improvement on the Eastern roads. That's where stages traveled first and most often. As expansion moved West, Stagecoach Routes were formed to supply the needs in those areas. The government in Washington eventually became involved by offering contracts to move the mail. And it took off from there. Stagecoach axles were first made of wood. Iron covered areas of rough wear. Wheels and the spokes were also made of wood. The stagecoach brand Concord made their coach wheels to be of particularly high quality. They were constructed of well-dried and seasoned white oak, which didn't warp or crack.5 The outer edge rim was lined with steel, a reinforcement as it rolled on the ground. Steel springs formed the suspension. They made quite a bumpy, bouncy, unstable and uncomfortable ride. Concord stagecoaches had a suspension system of leather straps. Its true purpose was to ease the work burden on horses. A side benefit was a rocking motion for passengers,5 which made their ride more comfortable. What type of terrain would be traveled? What type of usual or unusual weather would be encountered? What was the main purpose of the coach? What (who?) would it be hauling? Would there be any possible dangers because of their hauls? So a need for quick speed/maneuverability? Farm Wagon - A very basic but strong transport in rural areas. Useful for farming families in every area of life. That meant a horse would pull the stagecoach for about a two or three hour shift. The horse team required 4 horses by government contract.8 Sometimes there was a 6-horse team, and sometimes the team consisted of mules. Team size depended on terrain, length of route and/or expected weather. Mules are much more sure-footed, can handle heavy loads better, and have more stamina. But they're more intelligent than horses. So they have a cranky reputation, since they'll try to make their own decisions! They were the preferred team if the route was particularly rough. Teams pulling a stagecoach had their roles. Each horse or mule was especially trained and suited to their position in the team. They know it, are used to it, and that's what they actually wanted to do.5 They're really set in their ways! The two in the front led the team. So they're called the Leaders. They were the smallest pair of animals. The two closest to the coach are called the Wheelers. They're the biggest, strongest of the set. They can pull most of the weight, that of the stage. They also primarily help steer or maneuver the stagecoach. If it's a 6-Up, then the middle pair are called the Swing Team. If they're in the team, they'll be the next biggest pair. They help with the steering. The way they do that is to start the pivoting moves when the stagecoach goes around a corner. Imagine you're the driver looking out at your team. You would refer to the left side of the horses or mules as the Near. You'd refer to the right side as the Off. 8 King, H. (1857, April 20). Report of the Postmaster General: Contract with J. Butterfield and Co. P. 1-4. Congressional Series of United States Public Documents, Senate, 35th Congress, 2d Session, Ex. Doc., No. 48, Volume 984, page 151. Retrieved from Google Books. Kids love to play with little toy stagecoaches. Children act out scenarios with little figures. Their cowboys and cowgirls, little plastic horses, play the parts of the Old West. Interacting with the Native People they meet, as they drive along the trails in their pretend world! Do you remember doing that as a child? We sure do! We played with our miniature wagons of all sorts - stagecoaches. We watched all those Westerns, those Saturday morning TV features. The television Westerns of the 1950s like Tombstone Territory, Broken Arrow, Wyatt Earp, the Lone Ranger, the Rifleman, Roy Rogers, Sky King, Fury - they were some of our favorites. You know, some of us loved to get out our big box of Crayola Crayons to color in our coloring books! Kids still do. In fact, so do lots of adults now. There are even adult specialty coloring books!! It's a fabulous activity for parents and grandparents to get together with the young ones - and do together. Here's a Free Kid's Coloring Page! Get it - have it for your kids to color in their own stagecoach. Get a conversation going with them. Talk about the parts of the coach. How they were actually painted in the Old West. Maybe even take them on a trip to a museum where they have vintage stagecoaches to learn about. Or even take a ride on! Because of the Western connotation, the word Stagecoach or a related word comes in to play with festivals associated with Western style music, Western themed life, or Western history. Stagecoach Country Music Festival - Held yearly in Southern California, in Indio for 3 days. It's held outdoors, and big names are featured from the country music world. For instance - 53 acts over the 3 days. Just about anyone you can think of in Country Music has appeared here. It began in 2007, and the attendance has risen each year - until it has sold out in recent years. Camping provisions are provided on-site. Vendors are included inside the festival & entertainment is available, such as a dance hall. The best priced pass is as high as $1399 for standing right in front of the stage. The lowest is general admission at $349. Of course, there's parking charges, a shuttle, & other expenses that will come up while there. When tickets go on sale just after the beginning of the year, you can opt for a payment plan. Chuck Wagon Festival - Takes place in Oklahoma City on a Saturday & Sunday annually in May. It's sponsored by the National Cowboy & Western Heritage Museum in that same city. Get your tickets there: $15 each, kids 12 & under Free! Western Legends Roundup - In Kanab Utah. A unique festival, it centers on those old Westerns! Kanab was a place where many were filmed (more than 200!). Over 3 days in August, schmooze with some old stars, go on a wagon-train ride & see the old film sets. Llano Chuck Wagon Cook-Off - Very popular Hill Country area, Llano TX, 4-day event. Tickets sell very fast! $20. 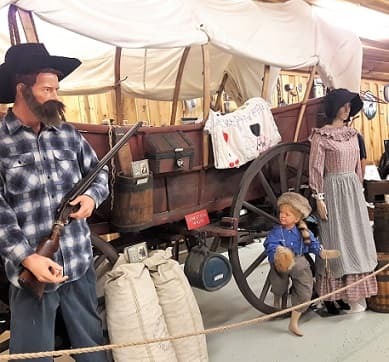 Focuses on authentic chuck wagons from the Old West & their cooking techniques. You get to sample the results!